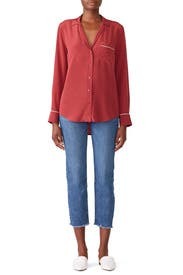 Loose and lightweight, this pajama-inspired blouse by Equipment features classic piping and a high-low hem. Red silk (100% Silk). Top. Long sleeves. V-neckline with shirt collar detail. 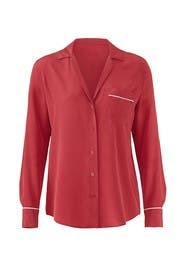 Exposed front button down placket. 28" from shoulder to hemline. Imported. 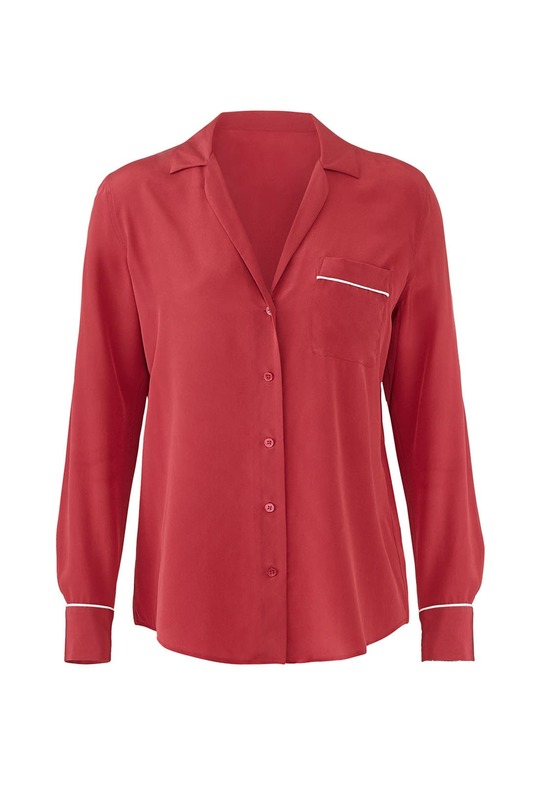 This is such a cute and trendy top that can be great for both work and casual. I wore it with jean shorts during the day and boyfriend jeans at night. Super comfortable as well. 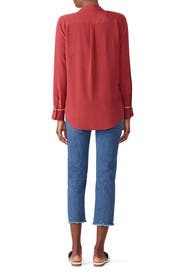 Fit great, loved the look of this tucked into high waisted jeans! So cute! Great look and very comfy. This shirt feels like a nice pajama shirt but nice enough to wear to work. I wore it untucked with my lighter washed jeans and brown booties. I got a lot of compliments! Toothpick arms? Might have just been me. Did come with lots of static and wrinkles but I'll steam it before wearing. Satin-y and chic. Very pajama-esque. Little low cut so will need to wear a cami. Very pretty but will not keep for more than one wear. Great color and got lots of compliments. It wrinkles very quickly though. I ended up returning this without wearing. I typically love Equipment blouses but this one didn't work for me. The v neck was very low cut. I would've had to tape or pin it to wear out. You can dress this top up or down. I wore it work and loved the color and fit. It was very comfortable. You could also dress it down and wear it with jeans for a date night. Super cute top, great fabrication and on trend. The neck is definitely a low v. Unfortunately the color just did not look good on my skin tone. The color was a beautiful raspberry, very similar to the photo. Loves the loose pajama-y fit tucked into dress pants. Only con is that it wrinkles fast while wearing. Other than that, it another well designed Equipment blouse. Fits true to size, a little low cut, but great for going out on the weekend. This had wrinkles right around the top button and some other places so looked a little messy. With this fabric, the fit was too loose and it seemed sort of shapeless. The neck line was low cut so showed too much undershirt. Overall, this just didn't lay nicely on my body. The fit is loose in a cool way; it drapes beautifully and looks effortless. The color is a soft, muted brick, which I love. 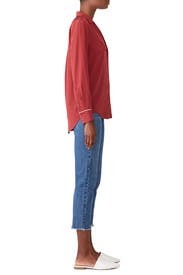 I'm pretty short, but the sleeve length still worked for me. It looks great tucked into jeans or with a fancy skirt. Big thumbs up! I loved this top! I got a few compliments. 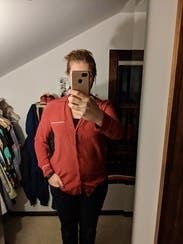 For me it was a bit tight through the shoulders/arms, but other than that it's pretty true to size and has a great fit that is a little slimmer than most tops of this style. The buttons also start mid-chest so you don't get the flapping-open that you do when there are buttons closer to the top, which made it look much more sleek. Very on trend and a great color! I'd probably size up next time but I have pretty broad shoulders and more muscular arms so if that isn't the case this is definitely true to size. Not a showstopper, but a great piece for spicing up the every day work wardrobe! I think this would have been cute, but in my size the sleeves were way too long. And you can't roll them up effectively b/c the fabric is v slippery. Plus rolling up the sleeves hides the cute piping.